Photograph, Portrait of Henry Rosenberg. Image courtesy of the Rosenberg Library. Image available on the Internet and included in accordance with Title 17 U.S.C. Section 107. ROSENBERG, HENRY (1824–1893). Henry Rosenberg, Galveston business leader and philanthropist, was born in Bilten, Glarus Canton, Switzerland, on June 22, 1824, to Johann Rudolf and Waldburg (Blum) Rosenberg. With limited educational opportunities, he went to work at seventeen in a textile factory, where he and John Hessly, the son of his employer, became friends. Rosenberg followed Hessly to Galveston, Texas, where he arrived in February 1843 to work as a clerk in Hessly's dry-goods store. He purchased half interest in the store and acquired the remainder in three years' time, then built it into the leading dry-goods store in the state by 1859. Rosenberg became a financier and investor and was active in banking, real estate, and transportation. In 1866 he was appointed vice consul of Switzerland for the state of Texas. He became Swiss consul three years later and held that position until his death. He began banking as a director of the First National Bank of Galveston in 1868 and expanded his interests in 1871, when he became president of the Galveston City Railroad Company. He was appointed city alderman the same year and served until 1872 as chairman of the licenses and assessments committee. He served a second term from 1885 to 1887 and chaired the finance and revenue committee. He twice served on the city library committee. He helped organize the Galveston Bank and Trust Company in 1874 and served as its president and manager. After buying out the other stockholders, he continued the bank under the name of H. Rosenberg, Banker, and functioned as its sole stockholder. Rosenberg was also president of the Gulf, Colorado and Santa Fe Railway Company from 1874 to 1877, during which time the company laid its first fifty miles of track. He served as vice president of the Galveston Wharf Company (see GALVESTON WHARVES) from 1889 until his death. The Texas Heroes' Monument. Image available on the Internet and included in accordance with Title 17 U.S.C. Section 107. Photograph, Grave of Henry Rosenberg. Image available on the Internet and included in accordance with Title 17 U.S.C. Section 107. He was a vestryman of Trinity Episcopal Church from 1868 to 1883; he contributed about half the cost of construction of Eaton Memorial Chapel in 1882. He withdrew his membership in 1884 and became active in Grace Church. In 1886 he donated the Rosenberg Free School to the city of Galveston. His civic contributions were not fully realized until after his death. His will provided bequests to family and friends, followed by bequests to various charitable and religious causes. Allotted in his will were $30,000 each to the Galveston Orphans' Home, Grace Episcopal Church, and a fund to put seventeen drinking fountains "for man and beast" around Galveston. 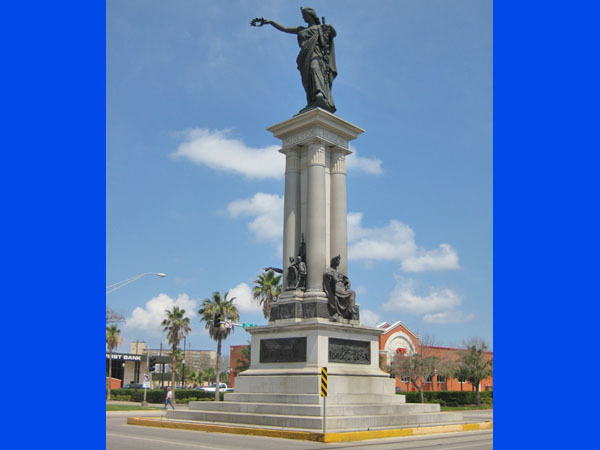 Rosenberg's will also provided $65,000 for the construction of a building for the Galveston Young Men's Christian Association and $50,000 for erection of a heroes' monument commemorating the Texas Revolution. All of these projects were completed between 1895 and 1900. The rest of Rosenberg's estate, more than $600,000, provided for a free public library for the people of Galveston, the first free public library in the state (see ROSENBERG LIBRARY). Rosenberg married Letitia Cooper of Virginia on June 11, 1851. She died on June 4, 1888. He married Mollie Ragan Macgill (see ROSENBERG, MOLLIE) of Hagerstown, Maryland, on November 13, 1889. Both marriages were childless. Rosenberg died at Galveston on May 12, 1893, and was buried in Ludon Park Cemetery, Baltimore, Maryland. John Henry Brown, Indian Wars and Pioneers of Texas (Austin: Daniell, 1880; reprod., Easley, South Carolina: Southern Historical Press, 1978). History of Texas, Together with a Biographical History of the Cities of Houston and Galveston (Chicago: Lewis, 1895). William Manning Morgan, Trinity Protestant Episcopal Church, Galveston (Houston: Anson Jones Press, 1954). Rosenberg Library, Henry Rosenberg (New York: De Vinne, 1918). Handbook of Texas Online, Jane A. Kenamore, "ROSENBERG, HENRY," accessed April 21, 2019, http://www.tshaonline.org/handbook/online/articles/fro75. Uploaded on June 15, 2010. Modified on May 18, 2017. Published by the Texas State Historical Association.